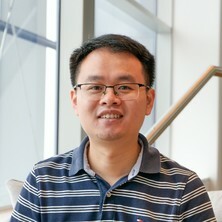 Dr. Ruizhi Zhong is a postdoctoral research fellow at The University of Queensland. His research interests include drilling, machine learning, hydraulic fracturing, and geomechanics. His current work involves the application of machine learning for drilling applications. He holds a PhD in petroleum engineering from the University of Tulsa and an MS degree in petroleum and natural gas engineering from West Virginia University. He is a member of Society of Petroleum Engineers (SPE). This project aims to develop rock properties from drilling data and some LWD data. Machine learning models (ANN, SVM, random forest, XGBoost, etc.) are used. The conventional wireline log data will be used for evaluation. Zhang, S., Zhong, R. and Liu, Y. (2016). Numerical modeling of land subsidence resulting from oil production. In: 50th US Rock Mechanics / Geomechanics Symposium 2016. 50th US Rock Mechanics / Geomechanics Symposium 2016, Houston, TX, United States, (499-508). June 26-June 29 2016. Zhong, Ruizhi, Bao, Jinqing and Fathi, Ebrahim (2014). Fully coupled finite element model to study fault reactivation during multiple hydraulic fracturing in heterogeneous tight formations. In: SPE Eastern Regional Meeting, SPE Eastern Regional Meeting, (418-429). SPE Eastern Regional Meeting.